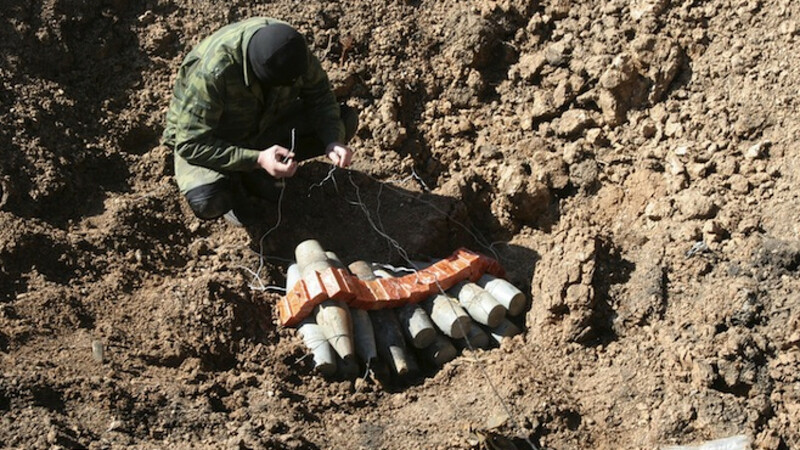 A rebel's sapper prepares shells of Ukrainian military for disposal at a range in the suburbs of Donetsk. KIEV — Ukraine's military accused pro-Russian rebels on Monday of using heavy weapons that were meant to have been withdrawn under a cease-fire deal, after one Ukrainian serviceman was killed and six wounded in rebel-held territories. 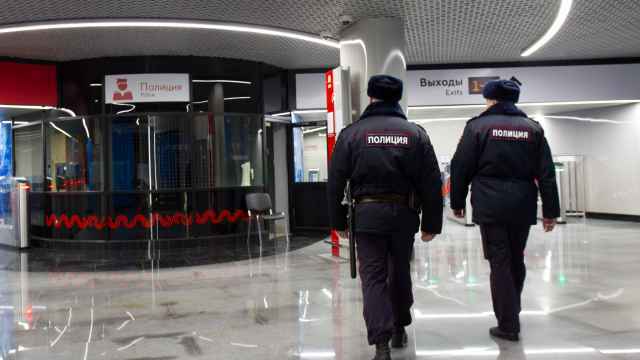 With fighting intensifying once more, the foreign ministers of Ukraine, Russia, France and Germany were due to meet in Berlin later Monday to discuss the next steps in implementing a cease-fire agreement signed in the Belarussian capital Minsk in February. 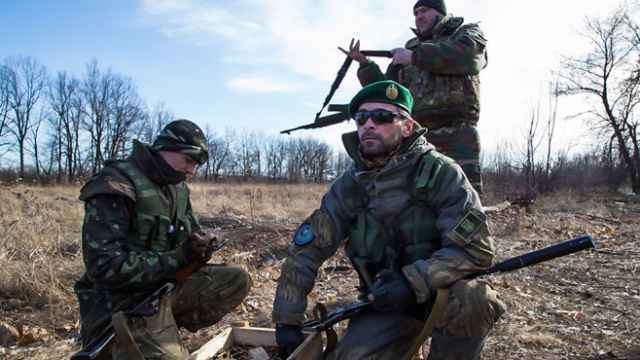 "The rebels have not stopped firing at Ukrainian positions. … Over the past day, the enemy has used weapons banned under the Minsk agreements," Ukrainian military spokesman Oleksandr Motuzyanyk said in a televised briefing. 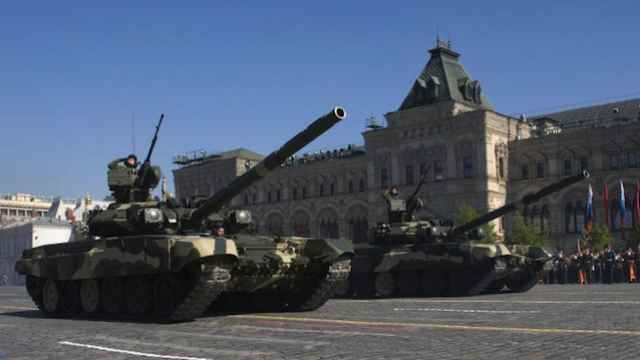 Under the deal, weapons bigger than 100mm calibre, including heavy artillery and powerful rocket systems, are meant to have been withdrawn from the front line. Motuzyanyk said rebels had fired at government troops multiple times with 120-122mm weapons. The Organization for Security and Cooperation in Europe (OSCE), which is monitoring the implementation of the cease-fire deal, also reported a sharp spike in hostilities over the weekend. 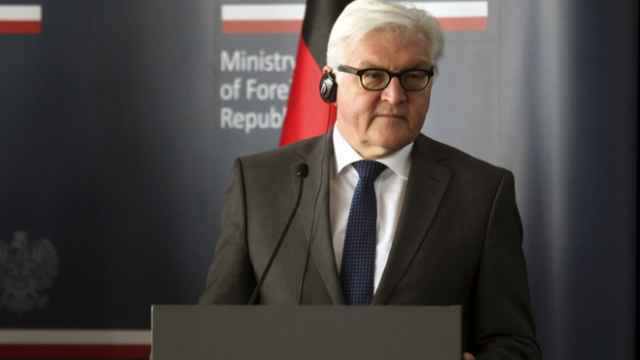 Speaking ahead of the four-way talks, French Foreign Minister Laurent Fabius said he and his German counterpart Frank-Walter Steinmeier were concerned by the cease-fire violations and a lack of political progress in Ukraine. Over 6,000 have been killed since the conflict erupted a year ago, when rebels opposed to the ousting of a Moscow-backed president and the installation of a pro-Western government declared independence from Kiev. Ukraine and the West say they have evidence that Russia has sent men and weapons to support the rebels, a charge Moscow denies.